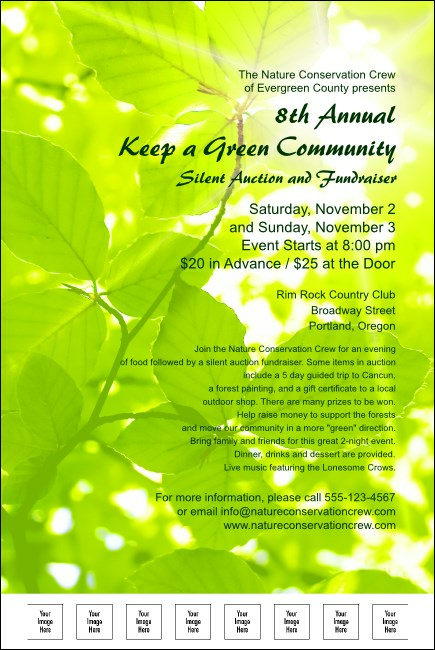 Light up your life with the dazzling image of sunlight filtering through the forest canopy when you choose the Green Leave Flyer to publicize your upcoming environmental event. Part of the matching templates in our Nature Series Green Leaves Event Pack, it's a fine way to fit all the green of the great outdoors onto an easy-to-hang Flyer. Save some extra green with affordable publicity Flyers from TicketPrinting.com.